No bureaucratic bungling shall go unrewarded. Be it at the State Department, Veterans Affairs, Internal Revenue Service, the Justice Department, Immigration or the Bureau of Land Management. The man who was in charge of security for the BLM during the botched Bundy ranch cattle roundup two years ago — which resulted in the agency spending $1 million to round up a couple hundred head of cattle, only to release them when confronted by armed supporters of the rancher — has been promoted to a newly created position. Dan Love, who was in charge of BLM security forces in Nevada and Utah, will now serve as the BLM’s agent in charge of security, protection and intelligence nationwide. The intelligence part of the job reportedly includes gathering information on emerging threats, such as from websites and online social media. Why a land management agency should have what amounts to its own law enforcement division is a question to begin with. Even the Nevada Test Site uses private security firms. Aren’t actual law enforcement agencies such as the FBI and U.S. marshals, as well as local police and sheriff agencies, sufficient to protect these public servants? As for intelligence? Why does a federal land agency need a spy? He said most disturbing to him was the BLM’s establishment of a “First Amendment Area,” where any protests were supposed to be contained, calling that a trampling of Nevadans’ fundamental rights under the U.S. Constitution. 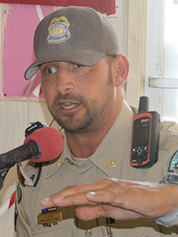 Though he said rancher Cliven Bundy must be held accountable for defying federal court orders and grazing cattle on federal land without proper permits, then-Sheriff Doug Gillespie was critical of the tactics and behavior of the BLM security forces for creating a situation that threatened to turn into a bloodbath. Speaking at an editorial board of the Las Vegas morning newspaper a couple of months after the roundup, Gillespie said he had a tense meeting with some of Bundy’s sons a few weeks before the agents moved in with armed vehicles, heavy weapons, snipers and attack dogs. He feared emotions would boil over. He noted that a video of one of Bundy’s sons being Tasered went viral on the Internet, prompting self-styled patriots and militia to pour into the ranch, an outcome for which the BLM was unprepared. Gillespie added, “You’ll have a hard time convincing me that one person’s drop of blood is worth any one of those cows,” adding that the BLM had no place to take the cattle it had gathered anyway. Two years later, Bundy, four of his sons and 14 others are being held without bail on federal charges growing out of the standoff. Love’s handling of the Bundy situation is hardly the first criticism leveled at his methods. In an article in the Salt Lake City Tribune in October 2014, rural Utah sheriffs described Love as Public Enemy No. 1. “Elected law enforcement officers from Nephi to Blanding call him an arrogant and dishonest bully who has little regard for local authority and dodges accountability, derailing a collaborative approach to police work on the state’s federal lands,” the article declares. According to the Reno newspaper, Love also has a penchant for demanding pampering for himself and his agents. Before the 2015 Burning Man festival in Black Rock, Love told festival organizers his staff would require a separate compound with amenities such as flushing toilets, washers and dryers, and 24-hour access to ice cream. The cost was estimated to be $1 million. The BLM backed off after being widely ridiculed. That’s how to mount the ladder of success in a bureaucracy. Here’s his first suspect….I despise the BLM and all it stands for. It’s a self serving bunch of morons that serve no useful purpose in the management of America’s land. The states are perfectly capable of protecting the peoples land. What the BLM does to our wild horses is criminal. What they have done in destroying our water supply, our lakes and streams is beyond the comprehension of intelligent life. Another arm of the government that serves no useful purpose. Right up there with the IRS and Dept of Education.